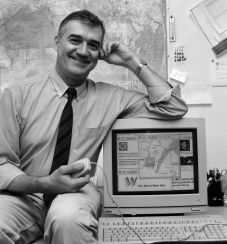 Robert Cailliau is most well known for the proposal, developed with Tim Berners-Lee, of a hypertext system for accessing documentation, which eventually led to the creation of the World Wide Web. In 1992, Cailliau produced the first Web browser for the Apple Macintosh. In 1993, Cailliau started "WISE", the first Web-based project at the European Commission (DGXIII) together with the Fraunhofer Gesellschaft. Cailliau also started the authentication scheme for the Web and supervised its implementation. He worked with CERN (European Organization for Nuclear Research) to produce and get the document approved whereby CERN placed the web technology into the public domain. Cailliau was one of the co-founders of the International WWW Conference Committee (IW3C2) after successfully organizing the first conference in 1994. During 1995, he was active in the transfer of the WWW development effort and the standards activities from CERN to the Web Consortium W3C. He then started, with the European Commission, the Web for Schools project, which has given support and access to 150 schools in the European Union.